On Nov. 1, the duo held their grand opening to introduce their new, rebranded business and they were rewarded with both local residents and new visitors. The transition between owners occurred in October of this year, when Lisa Zindash and April Howard, owners of the Farmhouse Vintage store, offered the opportunity to Tina Fuller. Fuller had been assisting the owners since March of 2018 and had a booth of her own within the store. Over time, she found herself with more responsibility working the store, and eventually the chance to have the store for herself. “It was just what I needed at the time,” said Fuller. Originally from the area, Fuller moved back to Jefferson in 2005 after spending the majority of her time traveling the world as a military wife. She bought a house across the street from the home she grew up in and loves every bit of her time spent in the village. “I grew up here. I have lived all over the world, but this village will always be home,” said Fuller. Although they have stepped down from running their Farmhouse Vintage business, both Zindash and Howard plan on having booths in the front of the store and continue assisting the Fullers with the transition of responsibility. “We were just ready to step back,” said Zindash, who plans on continuing to thrift and re-sell items. Refindary Vintage Market received its name because of the Fullers’ idea for re-finding an item to produce again, and they want their business to showcase the elements of re-finding, repurposing and reimagining through the vendors they have. “This all has been a challenge,” said Tina, who has been involved with repurposing furniture for over thirty years. As a military wife, she learned about being thrifty and working on a budget. “I’ve always done this, re-doing things for our home has just been second nature to me,” she said. The very first piece she ever repurposed was a small marble-top wash stand while she was in the United Kingdom with her family. After liming and stenciling the piece, she continued to keep it with her as she has moved across the world, and it currently resides in her home, for good.Twenty vendors serve in The Refindary Vintage Market and a collection of items fill both the first and second floor of the building. Antique, primitive, vintage, rustic, repurposed and handcrafted items are offered from vendors that genuinely enjoy bringing new life to old things. The building itself has been around since 1890 and the duo intends on keeping the historic value and appeal. Future events will be held in their store, much like their recent Holiday Boutique on Nov. 6 where several businesses, including Mary-Kate and Premier Jewelry, used the shop as a venue for their customers. The Fullers hope to bring in stenciling, painting and other artistry classes to the store and will offer events during the winter. “There isn’t much to do during the winter months, so we want to provide something for the community that’s fun and will help get them out of the house,” said Tina. 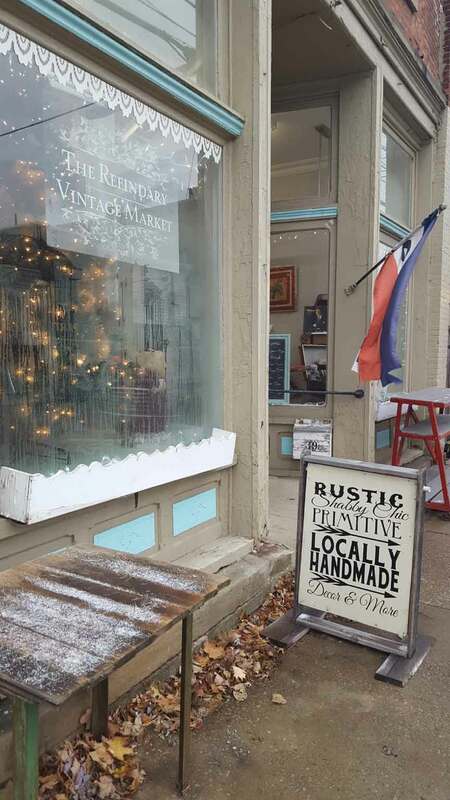 The business is open Tuesday through Friday from 10 a.m. until 4 p.m. and Saturday through Sunday, 12-4 p.m. For more information, the Refindary encourages visitors to view their website: https://refindary.com/ and their Facebook page where they highlight their vendors and items they are selling. “We market them and we want to make sure they are getting the spotlight they deserve,” said Tina. Tina and Emily are thankful for the support they have received so far and are looking forward to having fun with the business and enjoy their time together as they offer an experience to shoppers as they enter the historic building. “Everyone has been so incredibly sweet and positive. We’re a small business and a new business and we really want people to come in and visit us,” said Tina. Hot chocolate and coffee are free to shoppers as they walk through and the items displayed are unique because vendors continuously bring in new furniture, antiques, and knick-knacks to the store. The hope the Fullers have is to bring in more vendors and build their market of customers all while representing the small-town feel that Tina has always cherished about Jefferson. “This business is new, but I’m not. This is home,” said Tina. The storefront of The Refindary Vintage Market, located on 39 S. Chestnut Street.